In a medium bowl, whisk together the milk, potatoes, butter and eggs. In separate bowl, whisk together flour, sugar baking powder and salt. Add dry ingredients to wet ones. Stir well. 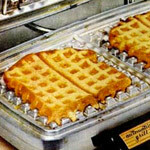 Cook waffles at your favorite setting. This makes 8 to 10 waffles. I love these with maple syrup. They're also great with just butter and a sprinkle of brown sugar. 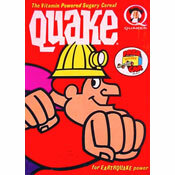 Mr Breakfast would like to thank MamaMia for this recipe. 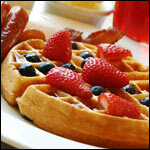 What do you think of Sweet Potato Waffles II? I used cubes of sweet potatoes and mashed them up. 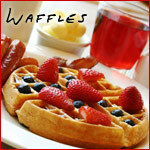 I followed the ingredients and used a waffle maker. It was excellent! I added a lot of extra milk, didn't measure, and it was still very thick. I tried it in the waffle iron anyway. My hubby liked it but I won't make it again. Sorry. There must be something wrong with the recipe. The batter was definitely to thick but I added 1 1/4 cups milk plus one tablespoon maple syrup in to the batter and they were delicious. Definitely a typo on this recipe. I added two cups of milk and it made 4 Belgian-style waffles. They turned out great and were very tasty. After seeing the first result from the recipe I did not think they were going to turn out at all after I mixed in the extra milk. I served them with chicken fried chicken, green beans and pure maple syrup! I threw these out even after adding all kinds of extra milk, oil, spices, etc. to this batter. The batter was incredibly thick, but I served the waffles to a group of picky four and five year olds, and they all loved them!! 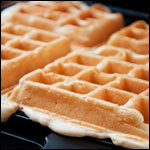 The waffles came out nicely, they just didn't look too pretty because they were hard to spread. The batter is definitely too thick, almost like brownies. I added probably a cup more of milk. 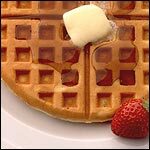 Other sweet potato waffle recipes are similar - maybe there's a typo in the ingredients? Perhaps reducing the 2 cups of flour to 1 cup would work. The batter was waaaay too thick and I followed the recipe exactly. So I ended up adding more milk and some oil, but they were still too heavy. They had just the right amount of sweetness. The color was lovely and they came out nice and crispy. I think the addition of some pecans would be delicious, or even just sprinkled on top. My only negative is that the batter was too thick, but this is probably my fault because I substituted whole wheat flour and ground flax seeds for some of the all purpose flour. Adding more milk seemed to fix this.